What Is Tethered Spinal Cord Syndrome ? By admin , in Herniated Disc on January 23, 2019 . From the brain’s base through the spinal bone and extending down to the lower back runs the spinal cord. Right after a child is conceived, certain cells gather together to form a pipe that will develop into the spinal cord. If this pipe fails to close completely, tethering of the spinal cord can occur. In tethered spinal cord syndrome, the cord abnormally attaches within the child’s boney spine. Tethered spinal cord syndrome can happen in two ways. First, if a child is born with an open spine and undergoes surgery at birth to close the spine then the resulting scar tissue can cause the spinal cord to attach to the boney spine. Tethered spinal cord syndrome can also occur with a condition known as “spina bifida occulta, which may not may visible external symptoms although fifty percent of children show visible signs. In these two cases, the pipe that will become the spine did not completely close up during the pregnancy. This condition may not cause any problems until symptoms develop. Normally, the spinal cord is free to move when a child stretches or bends but if the child has tethered spinal cord syndrome, then the cord becomes stretched with the said movements. This causes tension on the spinal cord, which can lead to irreversible damage to the nerves and muscles linked with the feet, legs, bladder and bowel. To prevent this, it is crucial to detect and treat tethered spinal cord syndrome as early as possible. A child with tethered spinal cord syndrome may have the following symptoms: the skin on the lower back has fatty accumulation, discoloration, patch of hair, skin tag, or dimples; bowel problems, orthopedic complaints such as persistent pain in the back, weakness and/or loss of sensation in the feet or legs, or stumbling. If the child has one or more of the above symptoms, a physician would typically order an MRI or magnetic resonance image, which will give a 3-D picture of the child’s spine and spinal column. This will help the physician diagnose properly whether the child indeed has tethered spinal cord syndrome. 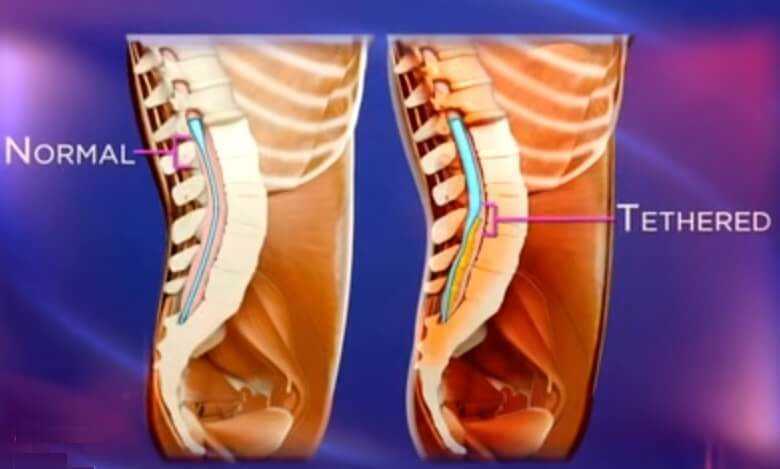 This condition can be treated through a surgical procedure to release the cord and allow it to hang without obstructions within the spine canal. The actual surgery may take four to six hours depending upon the extent of the tethering. The aim of surgery is to inhibit further damage to the spinal cord. Ninety person of children with tethered spinal cord syndrome who failed to get treatment developed permanent neurological problems. Hence, treatment is critical. When the condition is repaired, a patient will have just less than two percent chance of developing new related problems. Typically, there will be great relief from back pain but bladder problems usually does not improve even with surgery. The patient generally will regain strength, sensation and normal motor functions.